Find the document you want to approve. Click on “I” icon to view extra detail. Click on top right icon to go to the view document details page. 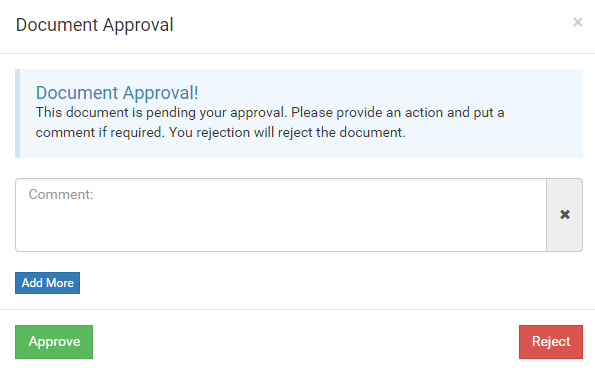 Click the “Approve “ or “Reject” button corresponding to your choke. Optional: You can add as many comments as you want for your approval or rejection. 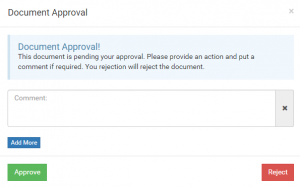 After all approvers have approved the document, it is accessible from the dashboard by users with Read access. If you log onto the Viewer account, you can now select the document group and download the document in PDF format. There are added benefits from distributing the members of your project into roles defined by user groups. If you wanted to remove a user’s access permissions, you can remove them from the user group instead of updating their permissions for each document. If someone leaves the project, instead of removing them from every document group and document, you simply have to remove them from a user group.